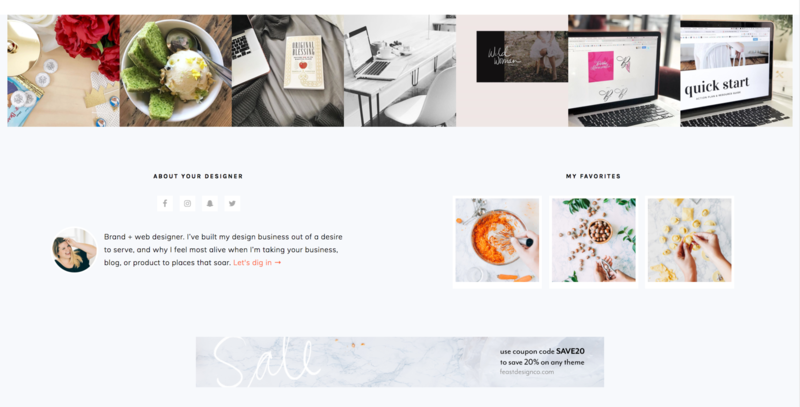 Configure the Foodie Pro Footer Widgets - Feast Design Co.
Foodie Pro has 4 available footer widget areas. Note: There needs to be a widget in Footer 1 in order for the other footer widgets to display. 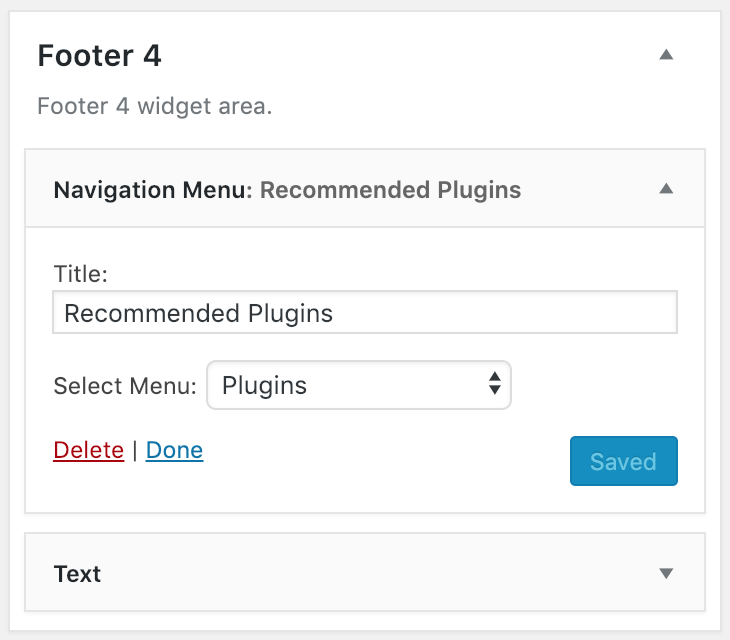 If you don’t want to use Footer 1 you can place a blank text widget there to get the other widget areas to display. 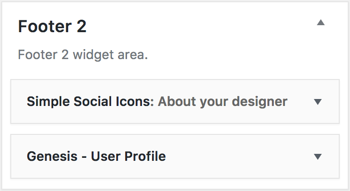 The Footer 2 area is configured for the Simple Social Icons plugin and Genesis User Profile widget. Please use the following settings to set up this widget area like the demo. Be sure to replace all of the data fields with your own information. These are the settings for the Simple Social Icons widget in the footer area. You can customize the text for your bio and then you’ll want to sign up for a Gravatar account to get your image to pull there. 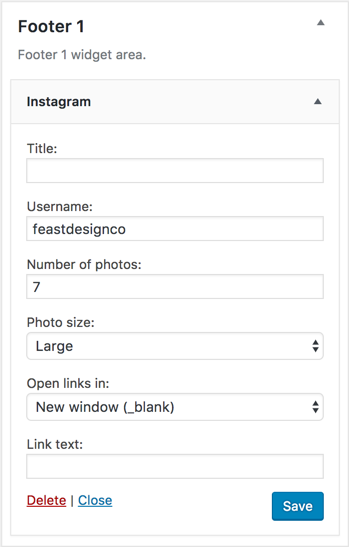 Please make sure you sign up to Gravatar using the same e-mail address you use to login to your WordPress account or the accounts will not link and your image will not pull. The Footer 4 area is configured as a full-width area suitable for a 728×90 leaderboard ad. 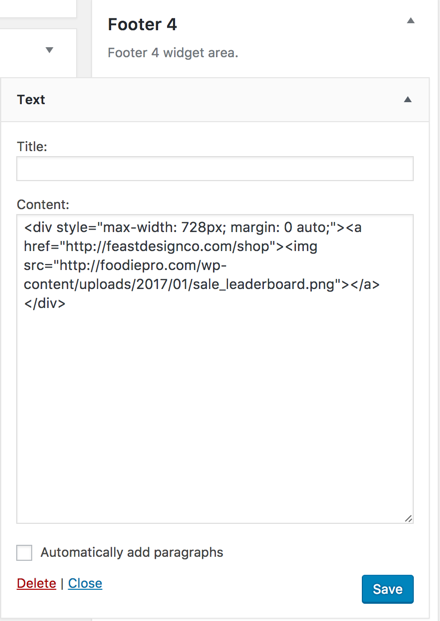 Simply drag and drop a text widget into place and paste your ad script. If you’re looking to add a menu to the footer area, you can use the “Navigation Menu” widget and drag it into any of the 4 footer areas.